If you are at all familiar with our work here at Slate Falls Press, you know we are huge fans of "two in one" combination knitting books. Therefore, we were really pleased to have been asked to host a giveaway for Elizabeth Green Musselman's new book, Kung Fu Knits. As a mom of two boys, 10 and six years old, this is right up our alley! Knitting + comics + martial arts = superfun imaginative knits! 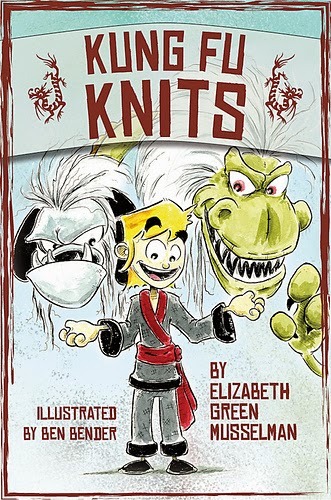 Kung Fu Knits includes six knitting patterns with full-color photos, clear instructions and schematics along with an awesome illustrated comic story kids are sure to enjoy. I am sure my boys will want a set of nunchucks and throwing stars after seeing this! We love how perfectly the story, drawings, photos, and patterns unite together in this playful book! Be sure to visit the rest of the reviews on Elizabeth's blog tour! Comments are now closed. Congrats to rosyretro for winning! To enter the giveaway for a digital copy of Kung Fu Knits, please leave a comment on this post and tell us your Ravelry username and the name of your favorite comic book hero! Giveaway entries will close on October 30 at midnight MT. My Rav name is Namma119 and my favorite comic book hero has always been Batman! My favorite are the X-Men (esp Wolverine). Asimplehomestd on Rav.